Pixel Picasso, Susan Kare, designed these towels to celebrate the bitmap feel of early computers. Susan Kare's towels are inspired by the Apple icons she helped make in the 80s (think the smiling Macintosh). Her reversible, black-and-white wave and raindrop patterns echo the nostalgic feel of early computer displays for good reason: They're designed for a Jacquard loom, which gives her an effect similar to those chunky Mac graphics. 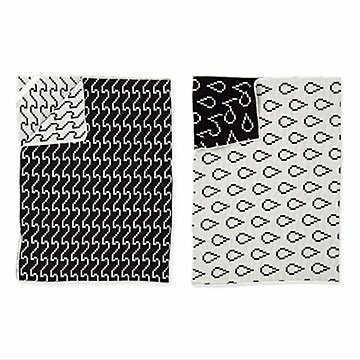 The set of two organic cotton towels makes a unique gift for tech lovers and modern kitchenscapes. Designed in San Francisco, California. Made in India. After graduating from New York University with a Ph.D. in fine arts, Susan Kare took a curatorial job at an art museum but quickly realized she was on the wrong side of the creative equation. In the 80s, she began work at Apple Computer designing fonts, icons, and graphic elements for the nascent Macintosh operating system and applications. Susan subsequently followed Steve Jobs to Next Computer as its tenth employee and Creative Director. She's the founding partner of Susan Kare Design, a graphic design practice in San Francisco, where she has designed thousands of icons for hundreds of clients, from Microsoft’s Solitaire cards to Facebook’s virtual gifts.